Good news for pregnant women everywhere: Doctors may have discovered how to lessen the effects of preeclampsia, a dangerous pregnancy complication. You know how you have to pee in a cup every time you go to the OB? 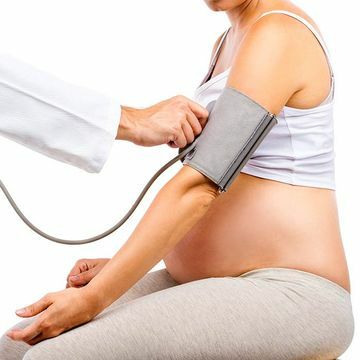 That's because your doctor is looking for an increase in protein in your urine, which is one of the symptoms of preeclampsia, dangerously high blood pressure that affects 5-10 percent of pregnancies. Previously, the only real treatment for the condition was to deliver the baby. Doctors have been making progress in diagnosing the disease, and now researchers have found a way to treat preeclampsia even very early in pregnancy by removing a protein from the bloodstream, thereby reducing your blood pressure. A small pilot study, published in the Journal of the American Society of Nephrology, described how the new treatment works: The researchers knew that a protein called sFIt-1 alters blood vessel growth and plays a role in preeclampsia. Testing the procedure in 11 women with very preterm preeclampsia (22-32 weeks), the doctors removed their blood, passed it through a column lined with a material that makes the protein stick to it, and returned the blood to the body. The treatment reduced the amount of protein in the urine and reduced the women's blood pressure. "Our goal was to remove a protein in the blood of women with preeclampsia and to assess if this was feasible, safe, and could potentially prolong pregnancy," lead study author Ravi Thadhani, MD, MPH of Massachusetts General Hospital and a professor at Harvard Medical School, tells Fit Pregnancy. "Our pilot study suggested this to be the case." The pregnancies continued for up to 8 days in women treated once and 15 days in women who were treated multiple times, compared with only three days in 22 untreated women with preeclampsia. Preeclampsia usually starts after 20 weeks, and often doesn't show up until later in the third trimester. But for pregnant women who develop preeclampsia early, this treatment could be crucial, because every day is important for baby's development. "This was tested in very preterm preeclampsia because the consequences to both mother and baby at this time can be especially severe," Thadhani says. "It is at this time delivery of the baby is not ideal because of prematurity, and the side effects of premature delivery can have adverse consequences to the baby not only at the time of delivery, but for years ahead." Every week that a pregnancy continues, Thadhani says, lowers the baby's risk of infection, brain bleeding, diseases of the eye and lung problems. "The goal is to develop treatments that allow pregnancy to be prolonged in a safe manner for 10-15 days at least," he says. Because the more treatments the women had, the longer the pregnancies lasted, Thadhani says it could even help women with preeclampsia carry to term. "Theoretically yes, [it's possible]," he says. "However most neonatal support services are excellent and can handle babies born after 34 weeks, leaving little risk by way of short-term or long-term consequences." The risks of the treatment itself include actually lowering the mother's blood pressure too much, but that was managed by giving fluids and adjusting the machine performing the treatment, Thadhani says. He noted that an allergic reaction could be a side effect, but that they didn't see any of significance. No risks to baby were observed—in fact, another benefit appeared to be that babies whose mothers had received treatment needed less supplemental oxygen after birth than babies whose mothers hadn't. This may be because preeclampsia toxins like the sFIt-1 protein have been known to cause breathing problems in preemies. Although this new treatment isn't yet available for all pregnant women with preeclampsia, the results of the initial study are promising. "Our pilot data is encouraging, however not definitive. We need to perform randomized trials to be certain the treatments are safe and effective," Thadhani says. "While not ready for the clinic, this study suggests a path forward to develop a safe therapy for all women with severe preeclampsia."